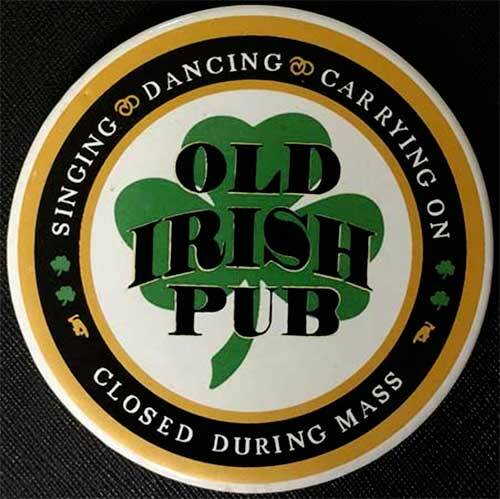 The following verse surrounds the perimeter of these Irish coasters - Singing, Dancing, Carrying On, Closed During Mass. 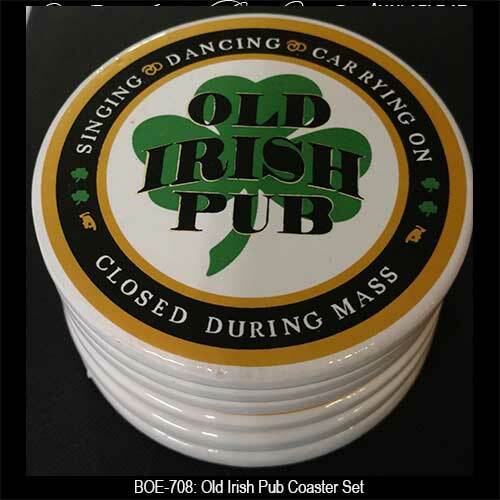 These round Irish coasters feature a center shamrock that is superimposed with the words Old Irish Pub . The six, 3 1/4" diameter, Irish pub coasters are ceramic with cork lined bottoms and are gift boxed with a shamrock history card, complements of The Irish Gift House. Personalized Irish coasters feature your name as the owner of the pub and are complete with a wooden stand. Shamrock coasters are great for entertaining in your Irish home or bar. The complementing holder will cradle the Irish coasters when they are not in use. Irish coasters are enhanced with Celtic knots and feature the Claddagh and shamrock along with the Celtic cross and harp.